All faculty are invited to walk in the Faculty Procession. You will receive an invitation via email in May 2019 and you must RSVP online with your correct code. This is important as the Ceremonies and Events Office needs to know how many faculty to expect in the procession and to seat on stage. Please note: Associate Deans and members of the Okanagan Senate have a different RSVP code – please check your invitation..
You must check in with Ceremonies staff in the Chancellor’s Robing Room (Gym: Hanger Studio 1) no later than 30 minutes before your ceremony. 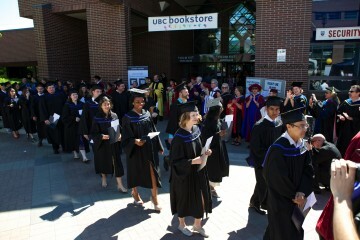 Faculty who have rented regalia from the Bookstore can pick up their regalia in the foyer of the Administration Building. 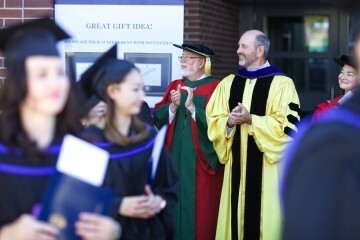 Faculty should be in the Courtyard in their regalia no later than 25 minutes before the ceremony start time. Once in the Courtyard, faculty will stand in line for the Faculty Honour Guard (applaud the student procession as it passes.) Faculty Marshals will give instructions. Note: Each ceremony will last approximately 90 minutes. Members of the UBC Okanagan Senate will meet at their assembly point in the Chancellor’s Robing Room (Fitness Studio 1 in the Hanger) where a senator will act as marshal to ensure senators can join the Faculty Honour Guard and make it back to the Chancellor’s Procession in time. Students will assemble inside the Fipke Atrium at the instructions of the Student Marshals and Enrolment Services Marshals. Students will receive their parchments and reader cards and then form a double line that will meet up with the bag piper in front of the Administration Building. The Faculty Marshals will line up the faculty members along the sidewalk starting approximately at the Security Office and leading towards the gym. They will wait for the Student Procession to pass them. The senators will join the line up once they’ve checked into the Chancellor’s robing room (Fitness Studio 1). At a signal from the Ceremonies volunteer, the bag piper will begin to play and will lead the Student Procession to the gymnasium. 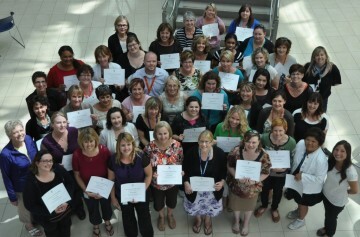 Faculty will applaud the students as they pass. The Student Procession will continue to the gymnasium and the Faculty Procession will follow. The senators will return to the Chancellor’s Robing Room to join the Chancellor’s Procession. The bag piper will lead the students into the gym. The Faculty Procession will stop at the entrance to the gym (beside the bleachers.) Once the students are at their seats, the bag piper will stop playing and exit the gym. 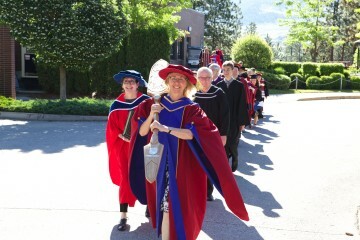 By this point the Chancellor’s Procession should have caught up with the Faculty Procession at the entrance to the gym. At the signal of the ceremonies manager, the Wind Ensemble will perform a fanfare and then processional music. The faculty and Chancellor’s processions will enter the gym at the fanfare and take their places on stage. The processions leave the gym in the reverse order that they entered it. The macebearer will lead the Chancellor’s Procession from the stage and out of the gymnasium. 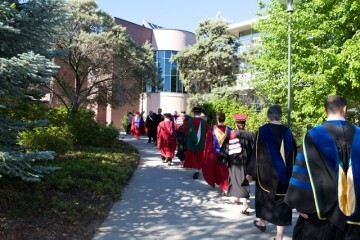 The Faculty Procession follows the Chancellor’s Procession. Once outside of the gymnasium, the senators and faculty members will not continue to the courtyard. They will line the sidewalk leading down from the gym to greet the Student Procession which will follow them out of the gymnasium immediately. This is the second Faculty Honour Guard and they will applaud the students as they walk past them. Once the Student Procession has passed by, the faculty will follow them back to the courtyard for the post-ceremony reception. Please encourage the students to go to the courtyard and not block the sidewalk as the rest of the guests (around 1200) will be exiting the gymnasium immediately after. Ushers will hold the audience inside until the processions have left the building. 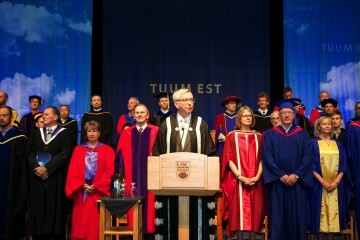 Our main purpose in Ceremonies and Events is to ensure that graduates have a memorable convocation. We hope that you will join us and volunteer your time to help us achieve our goal, while also enjoying the graduate’s pride and joy in reaching their ultimate goal. Ceremonies and alumni UBC are once again teaming up to help make the UBC Okanagan Convocation Ceremonies a memorable occasion for our graduates and their families. Numerous volunteer roles are available for alumni, faculty and staff members. To be a key part of the excitement! Because we can’t do it without you! Ushers: Hand out programs and direct guests to their seats, assist guests with accessible seating, direct families to the photo area, and provide guest support as needed. Student Marshals: Lead the student processions from the Fipke Centre to the Gymnasium and back after the ceremony has concluded. 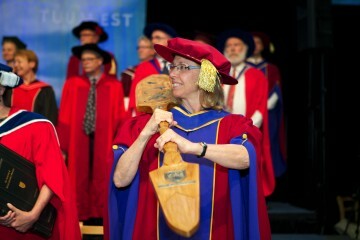 Gown and Hood Pinners: Assisting the graduates with pinning their hoods to their gown. Alumni Tent: Greeters to welcome the new graduates and their families to the UBC family, assist graduates with validating their A-cards, assist with framing of graduate degrees. Interested volunteers should complete the Volunteer Registration Form here. Please feel free to add the graduation days, June 6th and 7th, into your calendar right away! You can volunteer for one or more ceremonies, depending on your schedule. A Student's proudest achievement is receiving their degree in front of family and friends on graduation day. We invite our alumni to be a part of this momentous occasion by volunteering for one of the many activities surrounding graduation: greet students on stage, help them with their gowns and regalia, or join us in the alumni tent. Most importantly, this is your chance to warmly welcome our future leaders and global change-makers into the alumni family as they embark on their next journey. Interested in volunteering? Please complete the Volunteer Registration Form found at the bottom of the page.